Want to eat healthy food, support local and organic farmers, and save money? You can do all that—by eating with the seasons. Small, family-run farms are more likely to be organic and use sustainable farming practices than large-scale operations, and seasonal produce tends to be cheaper at local grocers and markets than fruits and veggies shipped halfway around the world. And no matter what, it would be beneficial to the fruit and vegetables in season. 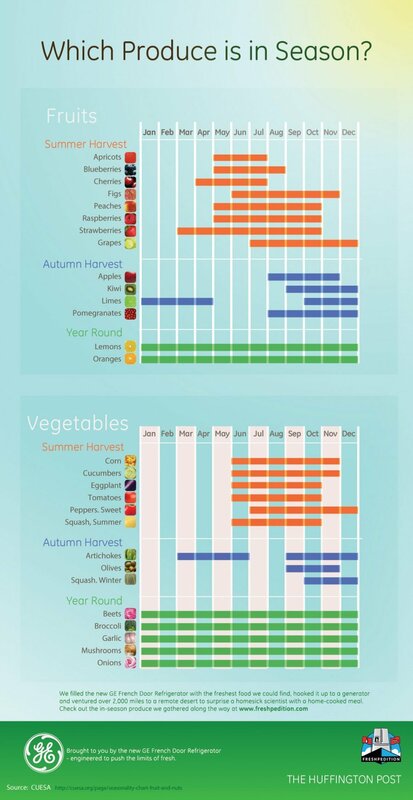 Here’s an infographic of when common fruits and vegetables are harvested. Peaches and raspberries are in season from May through October, while vegetables like eggplant and tomatoes are in season from June through October. The infographic below is an extremely simple method to seeing the current fruit and vegetables in season. Fortunately, some vegetables are in-season all year. These include beets—which are great to boost energy, particularly for dedicated athletes—and broccoli. Leafy greens like broccoli are known to help prevent prostate cancer. The health benefits of onions and garlic are also able to be felt throughout the winter. Onions can provide sinus relief, while garlic fights common illnesses better than antibiotics and is even among effective home remedies for toothache. As for fruit, lemon and oranges are also in season year-round – or can be. While the lemon tree can have ripe and unripe fruit at all times, oranges are in season all year round only when looking at two different types. Navel oranges are in season during winter and spring, while Valencia oranges are in season through spring and summer. Both of them are extremely healthful fruit that can provide a wealth of health benefits. Here are five superfoods in-season in late summer and four more for the winter. Visit your local farmers’ market or grocer to eat within the season and save money! Why is this information coming from General Electric? These guys are part of the problem.